These huge trees are fully covered with thousands of spiderwebs, something never before seen in Sindh, Pakistan, where this photo was taken. Yes, it's a eewrifying image, but it has had a surprisingly positive effect on the population of this heavily punished part of the world. How, you scream? 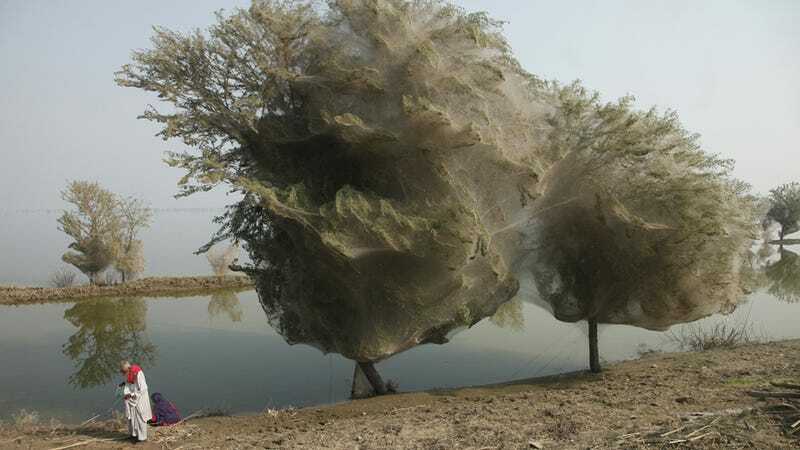 These spiders usually crawl on the ground but, when the massive July 2010 floods took over one fifth of the 307,374 square miles of Pakistani land, they escaped to the trees. The water is taking a long time to recede, so they thought it may be a good idea to adapt to the situation, establish camp and have a big party up there. The results is thousands of cocooned trees all around. Gross? It is. But the United Kingdom's Department for International Development thinks that the massive spiderwebs are a blessing and the eight-legged furry beasties are Bill Gates' new best friends. It seems that these giant sticky pompoms are capturing mosquitoes by the truckload. According to the people in these areas, the mosquito levels are extremely low for this time of the year. Even more so taking into account the vast amount of stagnant water, which acts as a nursery for those bloody winged buggers. As a result, the risk of a malaria plague is a lot lower than what everyone was expecting.